Scandinavian Kraka glass vase by Orrefors, designed by Sven Palmquist. Circa 1959. Number 411. 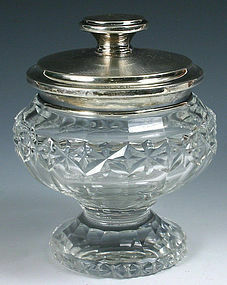 A hand blown vase in clear and blue glass with controlled bubbles. Excellent condition. Size: 9 inches ht. x 4.25 inches width. Signed on the underside. 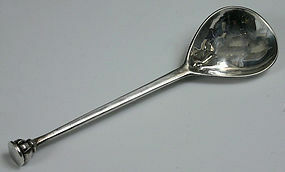 Gilded sterling silver and blue enamel sauce ladle by David Andersen, the noted Norwegian silversmith and designer. Stamped on the reverse of the twisted handle '925' and with the mark used by David Andersen from 1924-1939. Size: 5.75 inches length. Condition: excellent, with no damage. 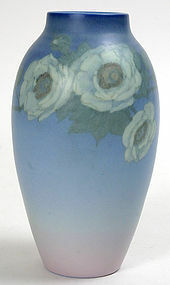 American art pottery vase by Rookwood, decorated in a blue vellum glaze shading to a rose color at the base, and adorned with white roses, painted by Ed Diers, with date code for 1928. Impressed maker's marks to underside of base. 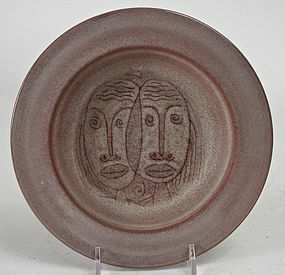 Size: 7 inches high. Excellent condition, with no chips, cracks or restoration.